Updated to include ExtendBorder v1.3. I just can't figure out how to add brushes in CBM (well, in the plugin.. but how do I add photoshop brushes? I believe that was a possibility ages ago?). Click the edit profiles button. Nicely done! Thank you so much for sharing your work, keep it up. Updated with Animated Image v2.2. For some reason the link to your website for the download doesn't work for me? Does it work for anyone else..? Works fine for me. Might have just been down for a little while. I dunno, maybe, I do something wrong. I uploaded converted into .png files Photoshop brushes, in separate folders, which were named "_name", into Custom Brushes folder. When I open CustomBrushesMini, the thumbnails, in the right column, represent some brushes incorrectly, some are not shown at all. Could anybody help me with the issue, please? Thank you. I hope this is the correct place to post this question. Is there any way to make this addin remember the size it was when last used and reopen at that? I've only used it a couple of days and am already sick of having to re-size it down every single time I open it. No I can't leave it maximized - I use the other desktop real estate for multiple other things. Hey there, i've downloaded Simon's plug in pack, mainly for the animated Gif feature, i've downloaded it all and everything appears but i can't see anything for the animated GIF! Am i missing something? or have i done something wrong in the download? I'm wanting to create some blog banners and want to include an animated GIF image in these. Hope someone can give me a bit of info or steer me in the right direction. It won't appear under effects. When you save an image, it will appear under the list of formats. Thanks Simon i appreciate your quick response, that clears it up for me. I tried it and when i go to save the image i don't get the option of an animated image, i only get the usual options; png, jpeg, gif and such like. It could be that you placed the .dll in the Effects folder instead of the ..\Program Files\Paint.NET\FileTypes\ folder. Thanks very much Djisves, that's exactly what i did! I appreciate you helping me. Thank you. No i still can't find the DLL for animated image, when i do the download everything else appears before i save the effects but there's nothing listed for animated image i have custom brushes, olden and all the rest. Ah confusion! it'll be me i'll have done something wrong somewhere! Have you looked in the File Types folder of the zip? Thank you Sarkut, i hadn't looked in there, and there it was when i went in! I can't thank you enough, you've been very helpful. Sarkut, i've got everything set up now and am saving my animated gif in the banner i'm going to make, but when i go to use it it's pixelated but it doesn't animate. If you want to, upload the file and post the direct link. Then we can look at what's going on in the file. Hey Sarkut, thanks for the reply. The trouble is it's happening with every gif image i have. I'll describe to you what happens and you can see if it rings any bells with you. I open the gif image i have that i want to put into a banner or piece of work, then i go to save it as an animated image at the end, previously it's listed as being stored as a gif. If i click on this image that i want to save as an animated gif, when the preview comes up on paint net i get an error message coming up and no picture. It just says preview file size error. It's probably something simple and i'm just missing it. Yes. That is a known issue. Usually if you OK the save, the file works alright anyway. I made a test GIF that worked right, so the plugin works. 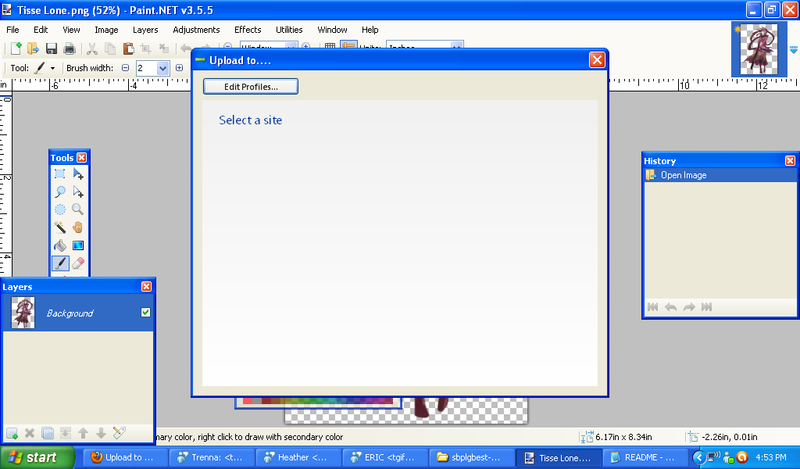 it will open in Paint.NET as a flattened single-layer GIF. Thanks Sarkut, i'm just gonna work with it and hopefully things will go right eventually.